After losing the first four races in the 35th America’s Cup, ORACLE TEAM USA took full advantage of the five day break and came out swinging today against challenger Emirates Team New Zealand. It was a tale of the start for both races, with the defender well positioned to weather and accelerating better than the Kiwis, only to pull the trigger too soon in the first race, a mistake they did not repeat in the second race. More importantly, it was clear that ORACLE TEAM USA had improved their boat speed since the two teams last raced on Sunday June 18. Race five went to Emirates Team New Zealand, who took full advantage of the OCS and a portstarboard foul made on the US boat to put themselves 4-0 up, but in race six the tables finally turned, ORACLE TEAM USA winning the race to mark one and hanging on to take the win. And with that victory, Skipper Jimmy Spithill made more history, tying Sir Russell Coutts’ winning record in America’s Cup Match races, recording his 14th victory, the same as Coutts. That win means the 35th America’s Cup will continue into Monday June 26 as neither team can reach the seven points needed to win the 35th America’s Cup in the two races scheduled tomorrow. However, the win also signifies the clear advantage Emirates Team New Zealand had over their US rivals in the opening weekend has gone, and that means even more compelling racing is guaranteed in the remaining head-to-heads between the two teams fighting for the oldest trophy in international sport. The battle on the water also carried on into the press conference after the action concluded on the Great Sound with the rivals looking back at the two races on day three, and the week they’ve both had to prepare for the resumption of hostilities today. Reflecting further on his team’s vast improvement and the importance of ORACLE TEAM USA cutting the overall deficit to Emirates Team New Zealand, Spithill added, “We all saw that the boat is faster, obviously we are not sailing as well as we should do, but the important thing is that the boat is faster. “We’ll be going straight back out on the water today to work on a few things. That’s a good position to be in, knowing there is more on the table and that the changes are working, the boat is getting quicker. “It was five very long days but the good thing is we’ve been able to reward the entire shore crew with a win. We now have confidence in the tool we have, which is the most important thing. “It does remind me of San Francisco when, once the guys can see that the boat is faster, then you start building some momentum. “Getting that first victory was important today but I believe there is more speed in the tank. “The boat is clearly faster because of the changes and it showed in the second race that if we as athletes can do a good job then the boat responds. In reply, Peter Burling acknowledged the new greater threat from ORACLE TEAM USA but remained confident in Emirates Team New Zealand being able to hold their advantage. “We knew to expect a battle and now it appears we have got one,” remarked Burling. “We felt they were a little rusty last weekend but we are under no illusions. When we entered this we knew we were in for one hell of a battle. It was nice to get those first wins and take a lead. “We came out of a good battle today and managed to take another win but we feel we have plenty more to come. “We didn’t sail particularly well today but it was great to walk away with another win. We’re really happy with the lead we have got and we’ll come back stronger, expecting a really great battle in the coming races. After five days away from racing Jimmy Spithill’s ORACLE TEAM USA’s fightback against Emirates Team New Zealand started in the worst possible style in Race Five, the team being handed a penalty for crossing the start line too early, allowing Peter Burling’s Emirates Team New Zealand to sail into a clear lead. However, despite the setback, the American team responded spectacularly, closing the gap completely rounding the second gate before taking the lead in the first pass of the America’s Cup Match, presented by Louis Vuitton, on leg 3/7. However, just as they had taken the lead, ORACLE TEAM USA were punished once again as the boats crossed for a second time on leg 3/7. Both teams appealed against the other but it was Jimmy Spithill who was penalised, his team having to fall two boat lengths behind his rival, effectively handing them the race victory. To add insult to injury, the Defender’s pursuit of Emirates Team New Zealand was hampered even further as a poorly executed manoeuvre then saw them lose all momentum, allowing the Kiwis to sail well clear on leg 4/7. The Kiwi team’s advantage stood at just over a minute at the fifth gate and by the time they crossed the finish line Emirates Team New Zealand were two minutes and four seconds ahead of their rivals, putting them 4-0 up at the end of race five. With the pressure mounting on Jimmy Spithill and ORACLE TEAM USA, they finally halted Emirates Team New Zealand’s charge, securing a timely and vital 11 second victory over the Kiwis in the sixth race of the America’s Cup Match, presented by Louis Vuitton, to cut the deficit to 4-1. 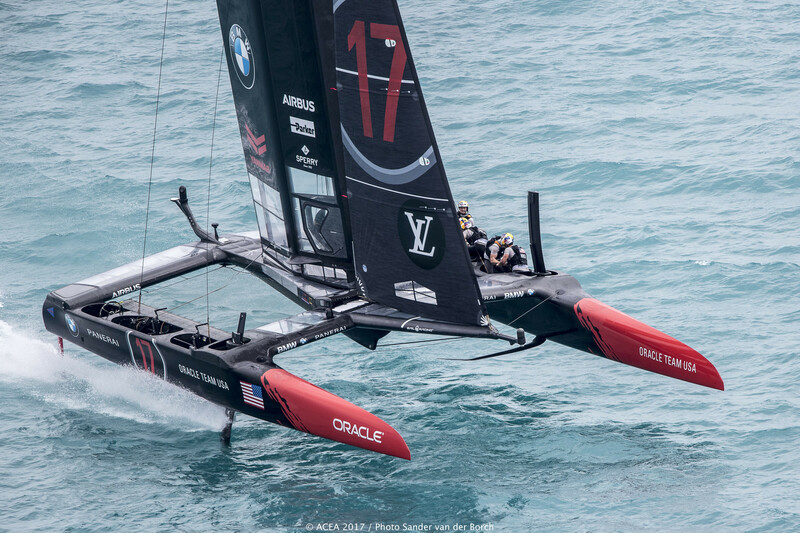 In contrast to the first race of the day, both teams crossed the start line cleanly, with ORACLE TEAM USA beating Emirates Team New Zealand to mark one for the very first time in the America’s Cup Match, presented by Louis Vuitton. The lead then changed hands twice on leg two but it was Jimmy Spithill’s team which held a slender 12 second advantage at the third gate. At gate four Spithill took a gamble, jibing in the run up to the next gate, but it proved to be an error and Burling took the shorter course to the gate to edge ahead of his rival. However, ORACLE TEAM USA’s new-found speed paid dividends on leg 5/7 as they cut the gap to their rivals and engaged in close-quarter racing. Two passes then ensued between the two teams, with Spithill coming out on top, nudging ahead at the fifth gate. Having eradicated the mistakes that had held back ORACLE TEAM USA in race five, Spithill kept his rival at bay in the run up to the finish line and sealed an 11-second win which, vitally, keeps ORACLE TEAM USA firmly in the America’s Cup Match, presented by Louis Vuitton. Race Five: Emirates Team New Zealand beat ORACLE TEAM USA by 2 minutes and 4 seconds . Race Six: ORACLE TEAM USA beat Emirates Team New Zealand by 11 seconds . * Scoreboard: While the Challenger has won five of the six races, their match score is 4-1. The Defender, which won the Qualifiers held on May 26-June 3, began the series with a one point advantage. As the rules detail, the Challenger would carry a one point disadvantage (i.e. minus 1), meaning they will need to win eight races to take the trophy whereas the Defender need only win seven races. Schedule: The dates of the Match extend from June 17 to 25, though will end earlier when a team scores 7 points. The next race day is June 25 and will continue daily thereafter until there is a winner.